Prominent figures to discuss issues of regional importance. 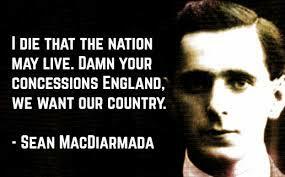 MacDiarmada, a signatory of the Proclamation of the Irish Republic, was executed by the British for his part in the Rising. If you fancy a bit of political debate Kiltyclogher in Leitrim is the place to be this weekend. The occasion is the Sean MacDiarmada Summer School where the agenda is focussed on issues of local and regional importance. Speakers today include Eamon O Cuiv, Mairead McGuinness and Caomhain O Caolain. Kiltyclogher in the north of the county is the location of the homestead of Seán MacDiarmada, a leader in the 1916 rising, and a signatory of the Proclamation of the Irish Republic. He was executed by the British for his part in the Rising at age 33.